Q: I’m interested in RYLA! How do I apply? Q: Who pays for RYLA, and how much does it cost? A: The sponsoring Rotary club pays $300 per student attendee. This includes your food, lodging, session materials and 3 RYLA t-shirts. Q: Who is my Sponsoring Rotary Club, and how do I contact them? A: If you got a congratulatory letter saying you were selected for RYLA, it probably came from your Sponsoring Rotary Club. Look for the Rotary Club name and contact info on that letter. If you didn’t get a letter, ask the person you got your original application from. Q: What is an Attendee? What is an Alternate? A: An ATTENDEE is a student who has been selected to attend RYLA. Each Rotary club decides in advance how many students they will sponsor, and pays for that number of students in advance. After interviewing the candidates, the Rotary club (or a guidance department acting on their behalf) will select that number of students from all qualified applicants, to be “Attendees”. The sponsor club may also designate any number of ALTERNATE candidates, just in case one of their selected Attendees decides at the last minute they cannot attend the RYLA conference, leaving an open slot that has already been paid for. When this happens —there are usually a handful of these each year— an “Alternate” will be invited to fill the opening. Q: Why must Alternates go to the effort of completing Online Registration, even though they might not attend RYLA? A: All Alternates must be correctly and fully registered, and their signed paperwork must be submitted by the deadline, just as if they were a selected Attendee. This ensures that their paperwork is all in place and we can slot students in at the last moment, if an opening becomes available. Q: What should I do if I notice an error in my Registration Data? A: Send an email to reg-info-change@ryla7910.org with a description of what needs to be changed. It’s important that your information be corrected prior to the RYLA Conference. Q: What should I do if my “school-out date” falls DURING or AFTER the 3-day RYLA Conference? 1) Ask your school/teachers if you can miss that day (with a note from a parent). 2) If you are scheduled for an exam, ask if you can take the exam in advance. If the school is unable to accommodate these requests, you should contact the District 7910 RYLA Committee Chair to discuss other possible solutions. Q: What really happens at RYLA? A: While we can't share the details of the sessions or programs with you before hand (it's a secret! ), we can tell you some basic information. 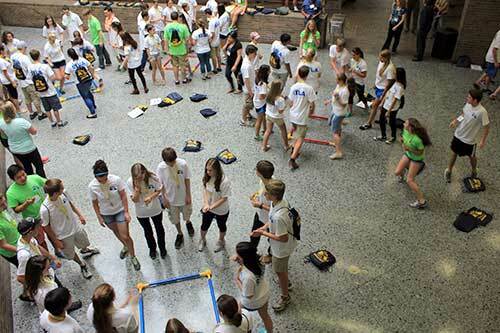 The About RYLA page provides a general overview. Additional details are noted in the answers below. Q: What are the daily schedules like? Q: What do participants wear at RYLA? A: All participants will wear a RYLA tshirt, their name badge, and the bottoms of their choice each day. A: Please see the Gear List. Q: May I bring a music player? A: Personal music players (such as a smartphone, mp3 player) are fine. They may not be used during group activities. You will be asked to leave them in your dorm room during the day. Please use earbuds or headphones when listening to music. Q: May I bring my guitar? A: You're welcome to bring an acoustic guitar, strum-stick, harmonica or other portable, relatively quiet instrument; however there is no guarantee whether you'll have a suitable opportunity to play it. You are solely responsible for any loss or damage, just as with all other personal property you bring with you. Q: Will we be sitting in a classroom all weekend? Q: How many students are in my group? A: There are about 6 or 7 students in each group or team. Q: Do I get to choose who I share a room with or who I’m in a group with? A: No, students do NOT get to choose their group-mates or roommates. We intentionally separate students from the same school. Q: How do I find out more about Rotary? A: Most RYLA students visit their local Rotary clubs BEFORE they attend RYLA. Contact your sponsoring Rotary club for more info. If you have questions that aren’t answered here, please Contact Us.